One Year of ‘Yahapalanaya’ in Sri Lanka: Transitional Justice in Crisis? Here’s an excellent Groundviews analysis from Niran Anketell – well informed for once by comparative international experience – of Sri Lanka’s current transitional justice challenges – and what needs to be done to address them. Thoroughly recommended. …instead of patiently doing the work of explaining the importance of a substantial international component in trials relating to serious crimes, the government has chosen instead to play word games, proudly claiming that it has averted the dreaded hybrid court. ..the current trajectory is a dangerous one. If the government is eventually forced to deliver on its unequivocal promises, it risks allegations of betrayal from within its constituency. If however it reneges on its commitments, it risks international censure from without and will inflame Tamil opinion from within. Just four months after it signed off on the Geneva resolution, the government’s fudge has come home to roost. 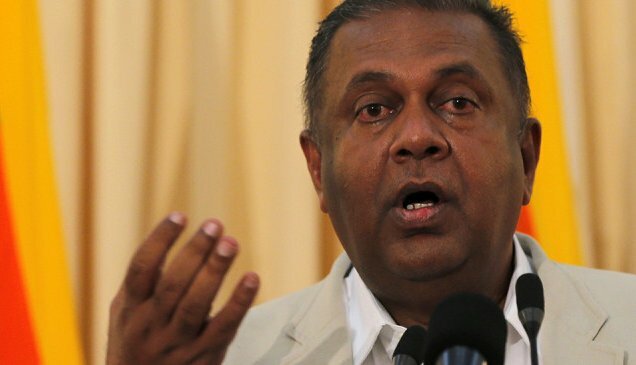 President Sirisena’s blunt rejection of any international participation in trials has triggered domestic and international concern over the sincerity of the Yahapalanaya government. Even as the Prime Minister and others scramble to repair the damage, their approach is nonetheless characterized by incoherence because they are unwilling to explicitly commit to any degree of international participation. The reason for this unwillingness is clear: delivering a special court to try international crimes with substantial international participation will involve some political cost. However, this cost will continue to rise if the government does not speedily create an enabling political atmosphere within which that cost is managed. By continuing to fudge the question, the government isn’t merely delaying the inevitable; it is also making things more difficult. It is in creating this enabling political climate that the government is failing. To ensure political support for any Transitional Justice processes, the government must go beyond the simple appeal to instrumentalism and develop a morally persuasive case as to why Sri Lanka must deal with the past. In contrast, the government’s only arguments for dealing with the past appear now to be restricted to the need to manage international pressure and redeem the reputation of the military. Not only do these claims fail to ennoble the Sinhala public, they trap that public in a siege mindset in which it is forced to grudgingly concede on dealing with the past because it is forced to. This attitude is incompatible with genuine Transitional Justice. Moreover, it creates the space for the government’s opponents to claim that international pressure could be handled better, while conceding less. It will also, sooner or later, lead to hostility towards international demands for justice – hints of which are beginning to appear in Sirisena’s increasingly defensive rhetoric. The moral case for Transitional Justice could be couched in terms of reconciliation or it could flow from a theory of just desserts. It may be a combination of the two. It may even be the argument that we need to reset our ways after thirty years of war, and that this calls for introspection on the way in which the despicable war or “mlechcha yuddhaya”—the term Sirisena used to describe the war one year ago at the 2015 Independence Day celebrations—was fought. There is no shortage of morally persuasive and culturally resonant claims for Transitional Justice. To be clear, this leg work needed to sustain Transitional Justice is political in nature. It requires political leadership and investment, but unless that investment is made, the costs of a Transitional Justice process for the political fortunes of those leading the government will continue to mount. Political leadership in making the case for dealing with the case is important, but it is equally important that the government develop a comprehensive policy to deal with the past. This requires more than merely identifying mechanisms or offices the government intends to set up. Thus far, the government has identified a Truth Commission, an Office of Missing Persons, a special court and an Office of Reparations. If implemented properly, each of these mechanisms could advance Transitional Justice, but the real measure of success will be if they are able to complement each other. For instance, while trials are essential to ending impunity, they will never be able to bring justice in respect of all crimes. The resulting ‘impunity gap’ – the gap between the number of perpetrators and crimes and the cases eventually brought to justice – must be bridged through other mechanisms. One option would be through vetting processes by which armed forces personnel responsible for human rights violations are removed from the military through a fair administrative process – another commitment by the government in the Geneva resolution. Another is through Truth Commissions which identify patterns of wrongdoing and in some cases, wrongdoers. Reparations could also help restore the dignity of victims. The government must also make decisions about sequencing the rollout of mechanisms. Typically, reparations are undertaken towards the end of a truth-seeking process, once victims are identified and patterns of violations unearthed. In Sri Lanka’s case, however, there may be a limited role for reparations in building trust and restoring some normalcy to the lives of those most affected. Another key decision is the division of labour between and sequencing of Truth Commissions and trials. The Sierra Leonean and Peruvian examples offer interesting insights into how trials and truth-seeking commissions could complement each other, but sometimes come into conflict. To be clear, not all of the outcomes in a Transitional Justice process could or should be choreographed. The interaction between political and other pressures on the one hand, and the momentum for victims’ rights will necessarily be dynamic. The ebb and flow of political space will also influence results. Nevertheless, some political moments offer great promise, and if this promise is to be realized, policy decisions must be made. In making these decisions, expert input and insights into comparative examples are essential, but in the final analysis, nothing can replace political vision and maturity. A tick-the-box approach to establishing mechanisms may impress some diplomats at the Human Rights Council, but it does not make for good Transitional Justice or smart politics. Unfortunately, this sort of strategic thinking around Transitional Justice is in short supply in Sri Lanka at all levels. Worryingly, this problem is not limited to government. While many stakeholders including within civil society have plenty to say on consultations and the importance of hearing victims’ voices, there is a distinct unease with engaging in the hard graft of strategizing the long term vindication of victims’ rights. In Chile, Argentina and Peru, civil society organizations strategically used Truth Commissions to change the narrative about the past and discredit perpetrators at a time when trials appeared impossible, while at the same time pressuring the state to prosecute through foreign courts exercising universal jurisdiction and regional human rights mechanisms. In doing so, some of those activists went into flawed Truth Commissions that were accused of shielding perpetrators, but their work eventually helped set the stage for previously unthinkable criminal trials. In Cambodia, activists and researchers began documenting crimes under the Khmer Rouge regime, collecting thousands upon thousands of pages of documentary and witness evidence many years before a hybrid court was eventually established. When the court eventually arrived, the evidence had already been collected. In Colombia, where a 2015 peace agreement between the government and the FARC looks set to generate a Transitional Justice process, activists have built capacity behind the scenes on Transitional Justice within their networks for years, enabling an incredibly rich and multidisciplinary conversation on dealing with the past. If Transitional Justice is to work in Sri Lanka, those of us in civil society will have to rise to the challenge in new and more meaningful ways. What then is the prognosis for Transitional Justice in 2016? President Sirisena’s comments indicate there is trouble brewing, and that is undeniable. Yet, I would argue that the problems facing Transitional Justice in Sri Lanka are more complex than a mere lack of political will. Instead, the present impasse points to the absence of two critical ingredients for success in dealing with the past: political arguments for dealing with the past grounded on comprehensible moral claims, and a strategic and comprehensive vision for Transitional Justice, in contrast to the proliferation of promised mechanisms on an ad hoc basis. Fortunately, it is not too late to change course, but if we do not, Yahapalanaya risks going down as yet another false dawn for justice in Sri Lanka.